Pápai Páriz Ferenc, Album amicorum p. 86. Deproperat abiturienti Patriae Spei, D[omi]no FRANCISCO P. Papai. S. R. I. Com[es]: Johannes Teleki. Philos[ophiae]: Studiosus. An[no] aetatis decimo sexto. You, who are wandering throughout the land burdened with so much evil / of our sweet fatherland, / Listen, Ferenc, to me who praying / wishes you all the best. / May God safely and healthily lead you / and may He bring you back to us in happiness. / Live and count many years / and see no evil. In the Transylvanian Kolozsvár, July 30, 1711. Count János Teleki of Szék was born around 1695/96, a son of Mihály Teleki (1671-1720), Captain General of Kővár (Chior), and Katalin Thoroczkay (?-1723), grandson of the great Transylvanian politician Mihály Teleki (1634-1690). In 1744 he also became Captain General of Kővár. He converted to the Catholic confession. He married Borbála Vay of Vaja. They had four daughters and three sons. He died in 1772 in Vingárd (Alsó-Fehér county, today Vingard). In the Album, the three brothers Count Teleki are followed by two younger members of the family, János and his younger brother Mihály. 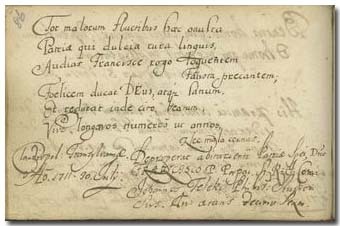 János made his note on July 30, 1711, at his age of sixteen. This means that, in contrast to the current standpoint of historiography, he was born between August 1695 and July 1696. On the same day made his note their tutor András Ajtai Szabó (p. 451).